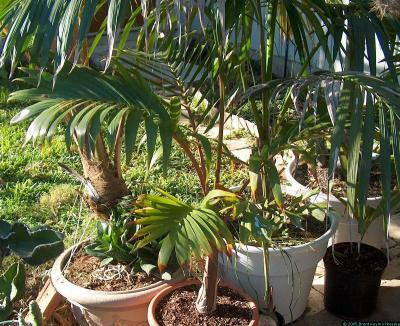 The bottle palm gets its name from the distinctive bottle-shaped trunk that develops as the plant ages. The plant in this picture is only about two years old. The bottle palm has about the same requirements as most palms. It likes sun, but will do well with only an hour or so of morning light or in the shade of a tree. It likes to be moist, but can suffer mild drought. It likes food, but can grow ok with poor soil so long as it isn't too heavy. It doesn't like below freezing temperatures, which is what caused the damage to the lower leaf margins on this one. I left this one outside one night when the temperature fell to the freezing point for about six hours and almost lost it. Since they can take low light levels, especially when it's cold outside, a garage makes a nice winter home.